New Premium CTTH single round Tourney . 200 credits added to purse . 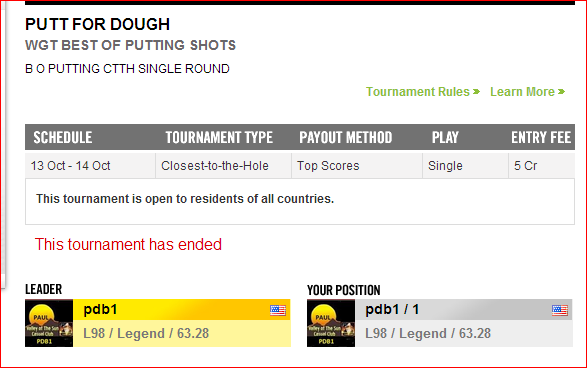 LMAO I will donate my 5 credits to this one but BO Putting is not good for me!!! Thanx for the donation Skip .
" For a nickel I will " continue to make these periodically . I intended the duration to be longer on this one . As there are several formidable putters on this course in our CC . MG , Trent , Gene , Rob , etc just to name a few . I will make it last longer next time . GOD HELP ME . OR SOMEBODY . I REALLY AM LOSING IT . The following just happened . What is the 53.87 ? Is that the winning score ? OMG . Had another Brain fart . Glanced at the 63.24 above ( 63.24 being my ave ) . Somehow thought it was my score . I am in the middle stages of CCOWNERHIEMERS so please forgive me .I feel sorry for everyone once I hit the later stages . WOW *** A GODAMN DUCK .
" 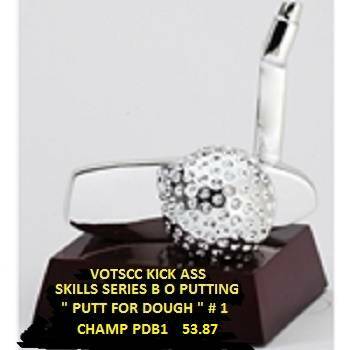 PUTT FOR DOUGH 2 " is up on the CTTH board . 200 cr to the winner . 5 days remaining . This B O Putting is one of my favorites . I used to make them all the time . I don't know if I will always have credits to put in . But I am going to keep this one running . Should they continue with the $ .05 entry ? anyway ? I think it gives it a little validity . But I don't want to alienate members who would other wise play it free . I see no issue with 5 credit entry fees. Perhaps alternating credit and free entry would entice more participation. Free when no real credits to be won and pay when there is a pot up for grabs. sounds good for me.How many putts do I get for 4 credits? lol. How many putts do I get for 4 credits? Damn i wish we could gift credits . If we can I can't remember how . I could gift you a club . You could sell it and have all kinds of credits .